Hotel started in 1925 by Sherwood "Gus" Moseman, who had owned a very successful mercantile business on Staten Island before serving in World War I. After the war, he returned to the family store in Big Hollow. As the years went by, more and more of his friends from New York visited, many staying for a week or two. Seeing a business opportunity, he sold the family store and opened a hotel. 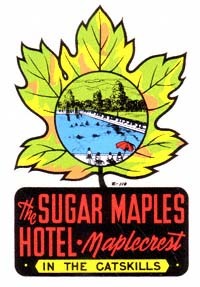 Several years earlier Big Hollow had changed its name to Maplecrest, so the new hotel was called the Sugar Maples. Like most of the successful twentieth century Catskill Mountains hotels, the emphasis was on food and activities. The 700 seat dining room became widely known for quality dining. Guests were kept busy with guided hikes, horseback riding, bicycling, tennis courts, a baseball field with roofed bleachers, a huge heated outdoor swimming pool, a roller skating rink, a library and an orchestra for evening dances. Business at the hotel started to slip in the late 1970's and early 1980's. Destinations like big theme parks and casinos pulled family vacationers away from the mountain resorts. The fact that alchohol was never served at the Sugar Maples probably didn't help either. In the early 1990's the hotel was closed and sold to a developer. It sat empty and decaying for over 10 years, before it was donated to the Catskill Mountain Foundation in Hunter. Fom the last 6 years, the Foundation has been restoring (where possible) the buildings into the Sugar Maples Center for Creative Arts.